Along the way in this essay collection, be on the lookout for Bessler’s surprising take on things like the role of the soul in mental illness and the spiritual glory of nakedness. There is a certain beauty in sameness—picture endless rows of red tulips or fields overflowing with sunflowers—but sometimes wisdom reveals itself on the scraggly edges of such displays, in the wildflowers that refuse to conform. 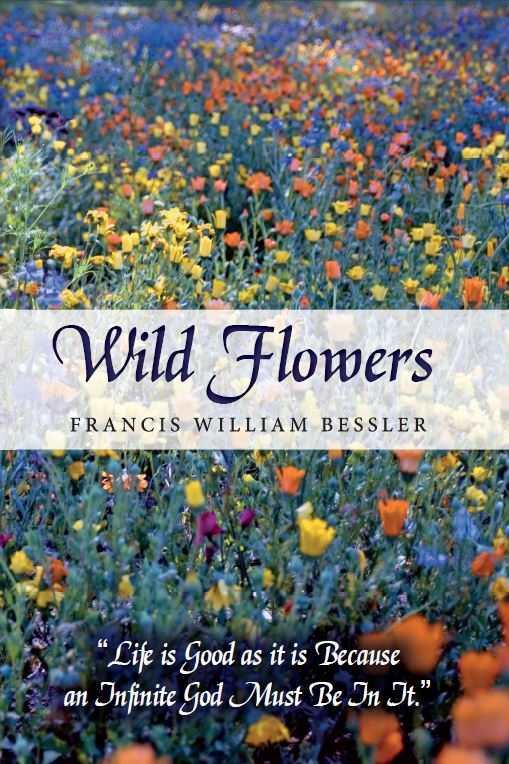 In this aptly titled collection, Wild Flowers, self-described “wild flower” Francis William Bessler enthusiastically broadcasts his musings on everything from the afterlife of the soul to right-wing politics. Bessler’s expansive writing reflects the evolving philosophy of a former seminary student who challenges his traditional religious education with an unconventional view from the edge. Twenty-seven essays and twenty-six songs or poems make up this volume, a collection of Bessler’s work drawn from pieces he has published on his blog (www.una-bella-vita.com) over the past two years. He’s been writing for far longer—he calls this book a fiftieth anniversary celebration of his writing life—and is quite prolific. Indeed, even though he limits the scope of this book to entries from December 2012 to July 2014, his musings run to nearly three hundred pages. Bessler loves life and is eager to share his inclusive view of the world. Bessler’s poems, or songs (they’re offered up as both), offer lighter fare for the most part, with familiar rhyming patterns and themes that focus on love, acceptance, and light. They’re most interesting read as adjuncts to the accompanying essays, as they offer a variation on the themes Bessler has focused on in his prose. Some thoughts and themes are repeated throughout the book, creating a rhythm that suggests a series of Sunday sermons. Bessler’s thoughts can be followed from cover to cover but can also be dipped into one essay/poem at a time. Along the way, the message might begin to seem repetitious, but be on the lookout for Bessler’s surprising take on things like the role of the soul in mental illness and the spiritual glory of nakedness. Wild Flowers is at heart a devotional to diversity, and there’s truly something here for everyone.